If you are looking to buy your cats a water fountain, there are many different options out there that may make your head spin. But if you do some research and check out what you truly need, you will have no issue picking out one that will make your cats happy to drink their water. 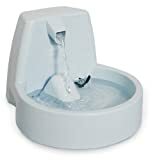 These are typically called cat fountains as the water moves, like a human fountain, which makes the cats more likely to drink. Materials – As your cat is going to be drinking from this, you want the containers and bowl to be food grade quality. One way to do this is avoid plastic and select a fountain that uses ceramic or stainless steel for the water bowl. Capacity – How much water can your fountain hold in comparison to how much your cat drinks? If you have one cat, it likely does not need to hold a gallon of water, but if you have several, then you will want one which can hold more water or you will need to fill more often. Stability – Pretty basic, you want one that your cat will not be able to tip out and create a puddle on your floor. Durability – Cats can be rough on things and their water dish is no exception. Make sure it is stable and well made so that it lasts more than a few days. Adjustable Water Flow – Add a bit of excitement into your cat’s life by adjusting the water for them or buy one that does it automatically. Filters – Rinse the filters between replacements with hot water. This should also be done when you are cleaning the fountain. These are typically made with charcoal. Do not forget to check the cost of replacements when selecting a drinking fountain; it may make the difference between affordable and expensive. Cleaning – Is it easy to clean? These automatic water fountains can harbor nasty bacteria so you want to clean it on a regular basis. A dirty cat fountain can also cause issues for the motor which can wear it out before its time. If you are considering one, here are some additional things to be aware of. Quiet – Noises may spook cats. If yours easily scares, or does not like loud noises, you will want to make sure any motors are quiet or else you will be wasting your money. Additional Reservoir – Having the fountain run out of water can cause a lot of damage, so having a spot for additional water is critical. This also helps if you will be away for a while. Having a cat fountain can be a great investment for both you and your cat. Chances are you are going to find some fun ones while shopping as these are designed to provide your cat some entertainment while you are gone as well. Catgypsy.. my one cat is scared of many things, so I try to be aware of noise. Great advice! I'm glad you mentioned the noise of the electric ones, because that is a problem I had that I didn't think of beforehand. It was too noisy and my cats were afraid of it. Heated cat beds are wonderful for keeping your kitty warm, but there are also therapeutic benefits as well. When your cat is part of the family you need to treat it that way. When it is always there for you when no one else is it becomes your best friend.